Add A Smoky Aroma to your dish to complete the flavor. Do you miss the smoky aroma in your home cooked Tandoori Chicken??? Don't worry your Tandoori chicken, Shami Kebabs, chicken kebabs, butter chicken and even dal makhani will have that aroma, without the tandoor. So what is a tandoor?? A tandoor is a big clay oven, which uses charcoal as its fuel (a little bit like a barbecue, except this has a lid.) The shape is cylindrical. 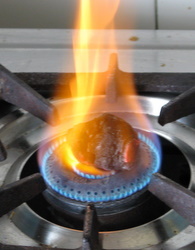 The charcoal is placed at the bottom. 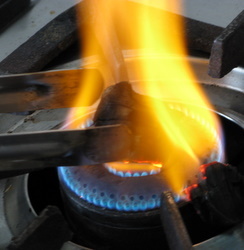 Any food cooked in this kind of oven, always has a smoky, char grilled aroma and flavor. Since it is not possible for us to have such an oven at home,the best we can do is use the same principle, to achieve that aroma and flavor. Take a piece of charcoal (just one will suffice). Wait till it becomes red hot. 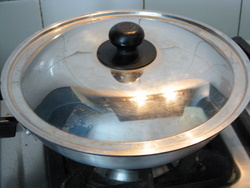 Make a well in the center of your masala and place a steel bowl or even an aluminum foil . 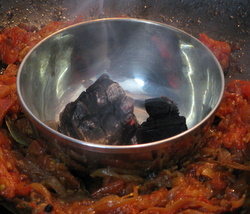 Lift your charcoal from the burner, using metal tongs and place on this foil or steel bowl. Pour 1/2 Tsp of oil on it. This will begin to smoke. Immediately cover this with a lid, in order to retain the smoke inside. Keep that covered for 15-20 minutes. 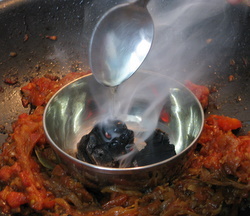 By now the masala or meat should have absorbed the smoky flavor. Just repeat the process, if you feel it is still lacking. Try this smoky aroma in some quick easy chicken recipes - Tadoori chicken recipe, butter chicken recipe and don't forget to use it in making dal makhani recipe.